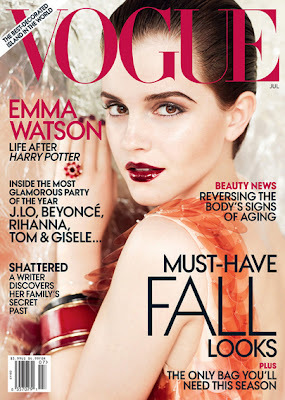 Lush Fab Glam Inspired Lifestyle For The Modern Woman: Harry Potter's Emma Watson is all Grown-Up and Fab on the Cover of Vogue! Harry Potter's Emma Watson is all Grown-Up and Fab on the Cover of Vogue! ﻿Harry Potter's Emma Watson is all Grown-Up and Fab on the Cover of Vogue! British actress Emma Watson who played the character of Hermione in the Harry Potter movies is gracing the cover of Vogue's July 2011 issue. With her new short-cut and gorgeous metallic outfits by Prada, Dolce & Gabbana and Calvin Klein, little Hermione is proving that she's all grown up. Take a look at Emma Watson's Vogue photos below. What do you think of Emma Watson's Vogue photos, are they Fab or Flub? Leave a comment below. Great pics very high fashion. I visited various blogs but the audio feature for audio songs present at this web page is in fact superb.